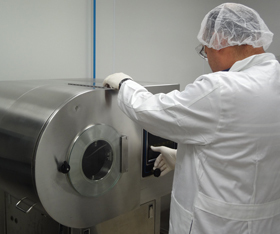 Sterling Pharmaceutical provides contract manufacturing services for tablets and fluid bed granulation products. Our contract manufacturing services are supported within one location, thus mitigating the challenges that can arise from downstream activities including, distribution and packaging. While there is an increasing trend to outsource manufacturing and packaging services internationally, the trend is believed to have been associated with a higher number of recalls and product delays. At Sterling we are proud to provide our customers with the flexibility of having a centralized location within the U.S. market, providing a single point of entry for small-to-midsize batches to enter a competitive and highly regulated market. With over 75years of experience in the pharmaceutical industry, the experts at Sterling possess an extensive depth of knowledge that is accompanied by well-developed distribution channels. As a contract manufacturer, we strive to build an effective relationship with our client through process control and well-planned activities to help avoid schedule delays and regulatory violations.